In the spring of 2016, the Program identified five homes of senior citizens in the Pompano community which were drastically in need of painting and refurbishing. In partnership with the City of Pompano Beach, the homes received pressure cleaning and a thorough painting and clean-up. 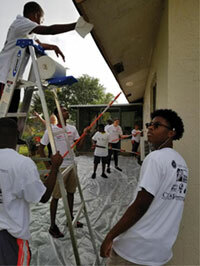 This year, in the spring of 2017, the Program partnered with the City of Pompano Beach CRA and Rebuilding Together to prep and paint 20 eligible homes in the Pompano Beach area. Some of the homes even received minor repairs along with flowers and plants. Approximately 300 volunteers from Pompano and surrounding areas participated in this exciting event!! Dignitaries on hand to assist in making this effort a success were Mayor Fisher, City of Pompano; Mark Bogan, County Commissioner; Marty Kair, Broward County Property Appraiser, and BSO representatives. Notable sponsors of the project were: Home Depot, Bank United, Peoples Trust Insurance, Waste Management, Nu Game Movement, and Bank of America.